GEORGE WASHINGTON. Letter Signed, September 11, 1789, to Governor Samuel Huntington of Connecticut. 1 p.
To ensure the legal unity of the new nation, Congress made certain that each state had copies of any acts that it passed. On September 15, 1789, Congress made it the duty of the Secretary of State to send two copies of each act of Congress to the executive authority of each state. Prior to the passage of this act, President George Washington sent these copies to the governors of each state. 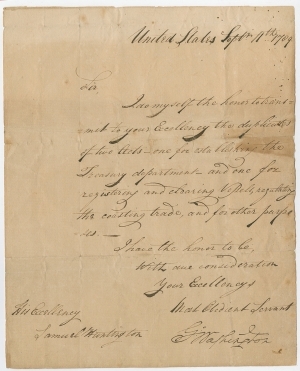 On September 2, 1789, the First Congress of the United States passed “An Act to establish the Treasury Department.” On the date of this document, September 11, President George Washington submitted his nomination of Alexander Hamilton as the first Secretary of the Treasury, the Senate approved the nomination, and Hamilton took the oath of office. That same day, Congress passed an act that set Hamilton’s annual salary at $3,500. A busy Friday! Hamilton held the office of Secretary of the Treasury until January 1795. Descended in the recipient’s family, acquired privately in 2017. On September 1, Congress passed “An Act for Registering and Clearing Vessels, Regulating the Coasting Trade, and for other purposes.” This act established procedures for registering American ships, granting licenses to trade among the states, and collecting fines and forfeitures for offenses against trade regulations.